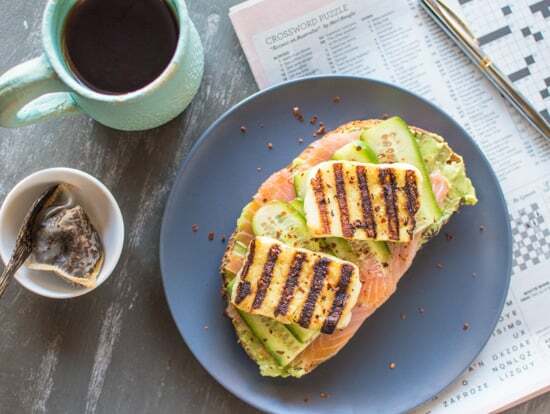 This avocado and hummus toast is perfect for days when you want a quick savory bite for breakfast. Plus, it’s ready in 5 minutes! I’m listening to Michael Pollan’s “Cooked” on audio right now (because let’s face it, that’s the only way I’ll be able to finish any book). Fun fact, he narrates the entire thing! Right now, he’s talking about the wonders of baking a fresh loaf of bread at home, and I can’t agree with him more. Although I’ve only baked a total of 3 loaves of bread, the aroma that floats around my apartment is the best. I’m ready to dig in even before the bread is out the oven! The most difficult thing for me to replicate in my bread-making adventures is the crackle. You know that sound you hear when you squeeze a nice baguette or a freshly baked loaf of bread? That crackling sound that lets you know that the bread has reached the peak of textural greatness. That same crackle I try to replicate by lightly toasting day-old bread. Yum. 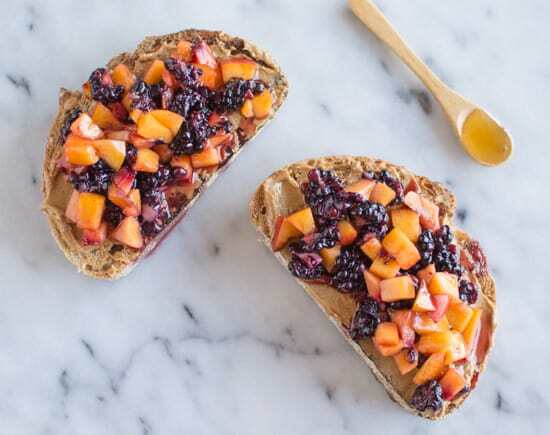 Picking out a loaf of bread is like picking out a good peach or an avocado—it’s got to have a little bit of give, but not too much. I’m that person at the supermarket who pinches several loaves of bread to make sure that I’ve got the one with the perfect crunch. Does anyone else do that? I swear that I’ve picked up that habit from my mother. 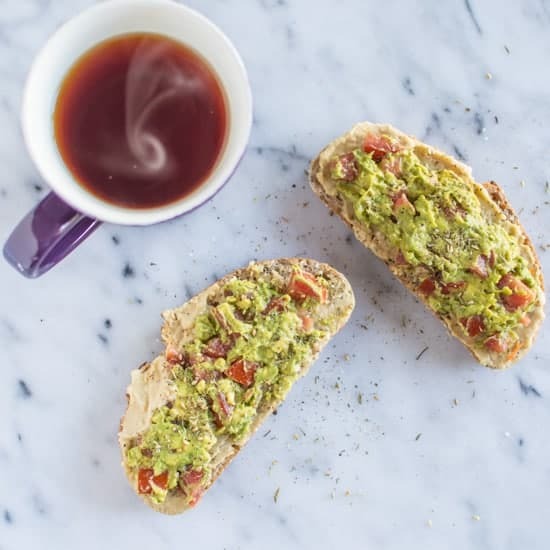 The mashed avocado and hummus provide an excellent textural contrast to the toast. 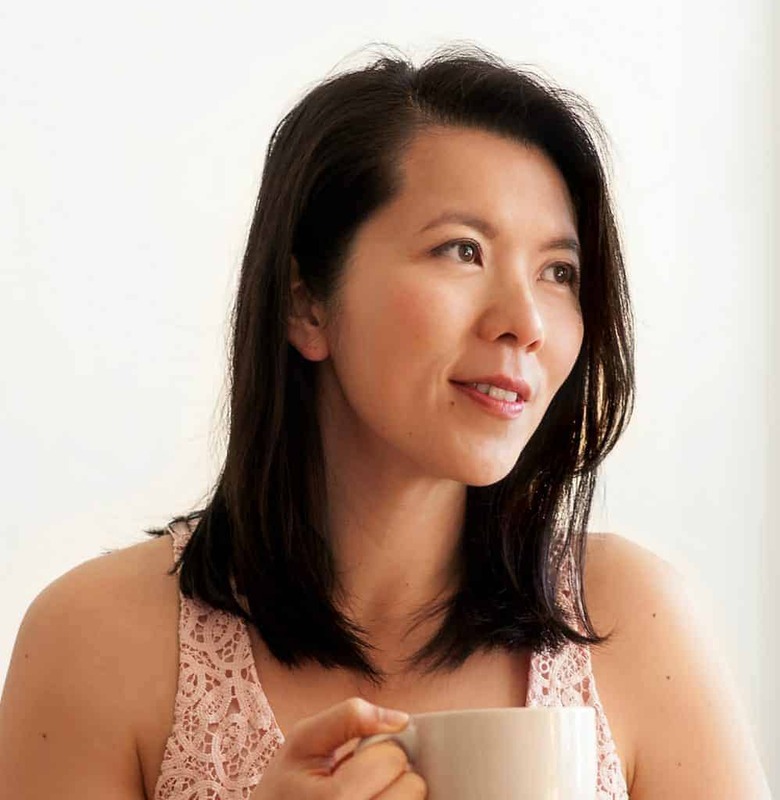 It’s perfect for those mornings when I’m craving something savory in the morning. Again, it’s a very simple thing to throw together in the morning, and I can’t believe I don’t do it more often! Toast the bread. 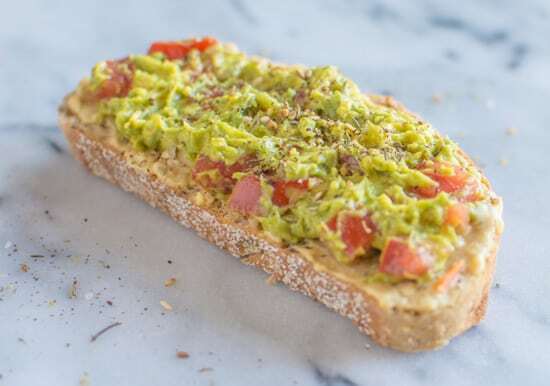 While the bread is toasting, mash the avocado in a small bowl, and mix in the tomatoes. Spread a tablespoon of hummus on each slice of bread. Then, top it with the avocado and tomato mixture. Sprinkle some za’atar for additional spice. i]For a za’atar recipe, check out this one from [Bon Appétit. Looking for more easy toast recipes? 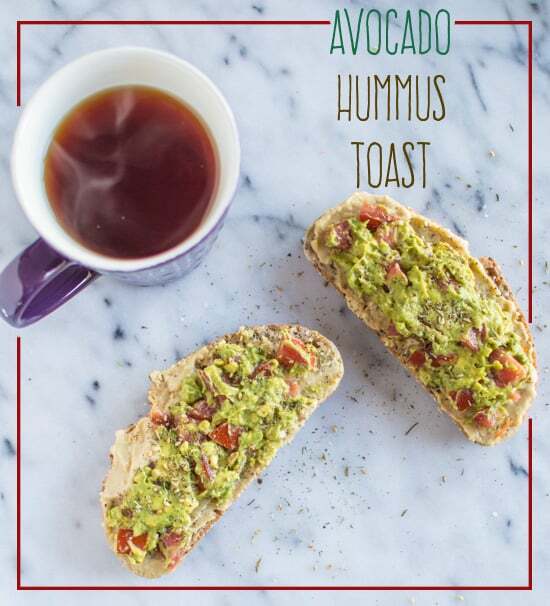 Avocado toast is a favorite of mine but loved that you threw hummus into the mix too! Why not?! Will be trying this combo very soon! Yes!! Let me know how it turns out, Kara! Thanks, Francesca! Let me know if you try this! This looks delicious! I eat avocado toast all the time, but I’ve never put hummus with it. Yum! They’re soo delicious together, Kelly! You’ve got to try it! Thanks, Erin! I don’t know if you’ve watched the Pixar movie Ratatouille before, but I always think of it when I squeeze crackling baguettes! I love your 5 ingredient posts. 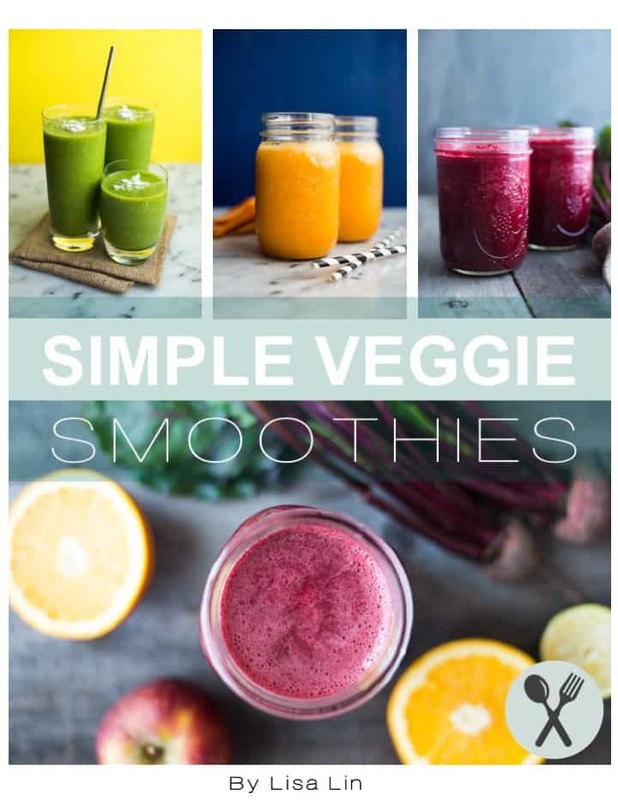 I always wonder what to do with my simple recipes that aren’t quite a recipe– and this is a perfect way to get them out there! The recipe sounds great but, is there something else I can use to replace tomatoes? Absolutely, Nonii! You can replace it with red peppers or just chop whatever vegetable you like. Hope you enjoy it! Sounds great! Just wondering if you recommend any types of bread and do you use shop brought hummus….I always find it is packed full of sugar!! Hi Becky! I always eat whole grain or whole wheat bread because they tend to have less sugar in them. I usually make my own hummus, but I would grab a tub of original hummus if I’m in a pinch. Hope this helps! Okay, this is absolutely delish! I can eat this for breakfast, lunch, or dinner! I have shared this awesome yumminess with everyone that will listen. It’s so easy and quick. I use garlic powder instead though.